The SalesforceIQ Communication Center gives you a centralized location to send all your emails, both individually and in bulk. To access the Communication Center, click at the top of any screen. 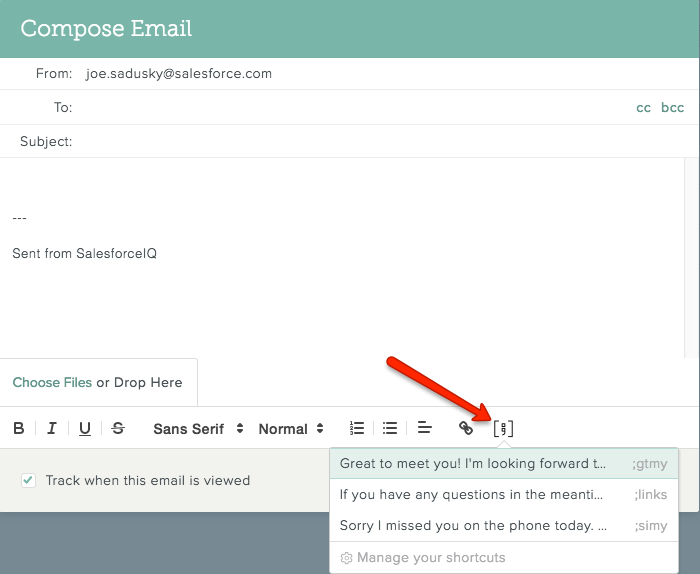 In the SalesforceIQ Communication Center, you can send a mass email to multiple recipients at once. Mass emails use templates containing merge tags to customize the email content. 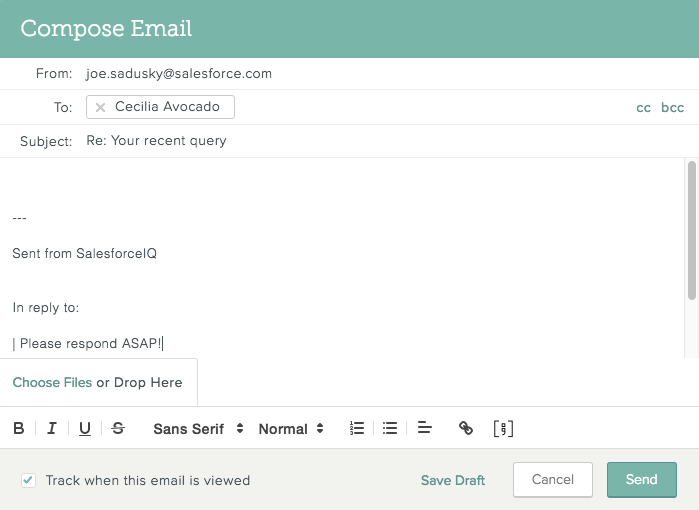 Sending mass email is available to customers on the SalesforceIQ Growth and Business plans. Note: You can send mass email to a maximum of 200 recipients per day. A message at the bottom of the send mail screen indicates how many recipients you have emailed via mass email in the last 24 hours. 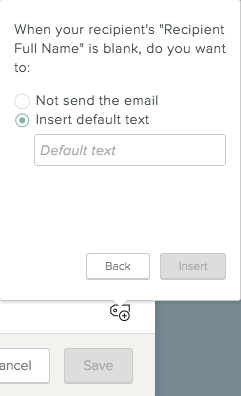 In the left navigation panel, click Send Mass Email. Enter a name for the email. This name is used for reporting purposes. To select the email recipients, do one or both of the following. 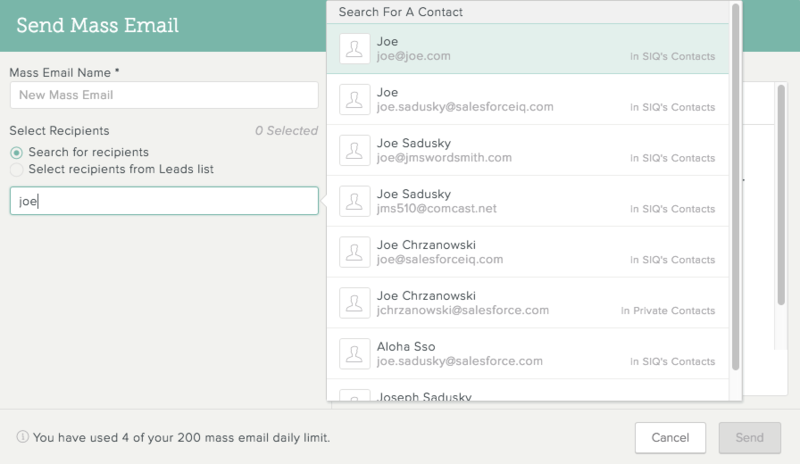 You can add recipients both from the Contact Gallery and from a List filter for the same mass email. To search for recipients from the Contact Gallery: Click Search for recipients and enter the Contact name. Select the Contact when it appears. Repeat these steps for all Contacts you want to add. To enter recipients based on a List filter: Click Select recipients from [List name] list. Then select which basic or saved filter you want to use to pull Contacts. 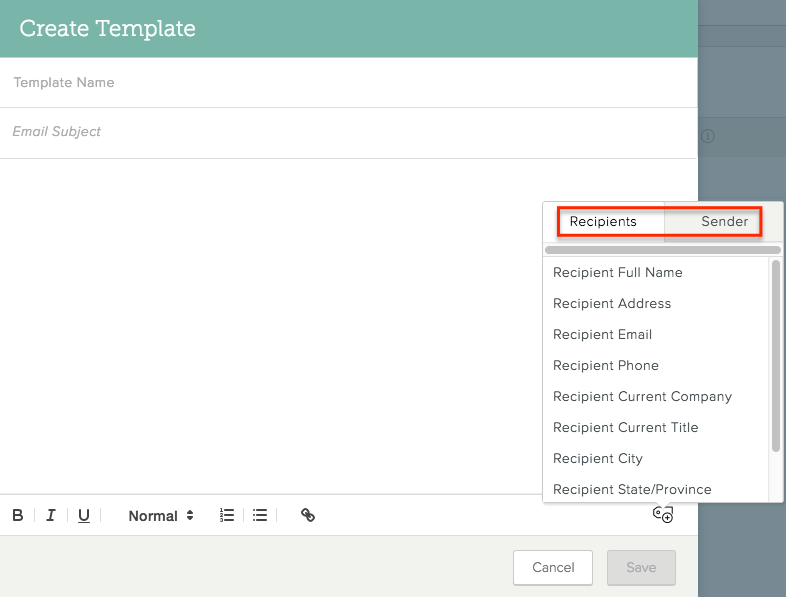 The option to select recipients from a List appears for Contact-based Lists only. If you select a Contact that is missing information from one of the merge tags, and you selected the option not to send the email if that merge tag was missing data, a message appears indicating that the message will not be sent to that Contact. After the Contacts are entered, you can remove individual Contacts by clicking X to the right of the Contact name. 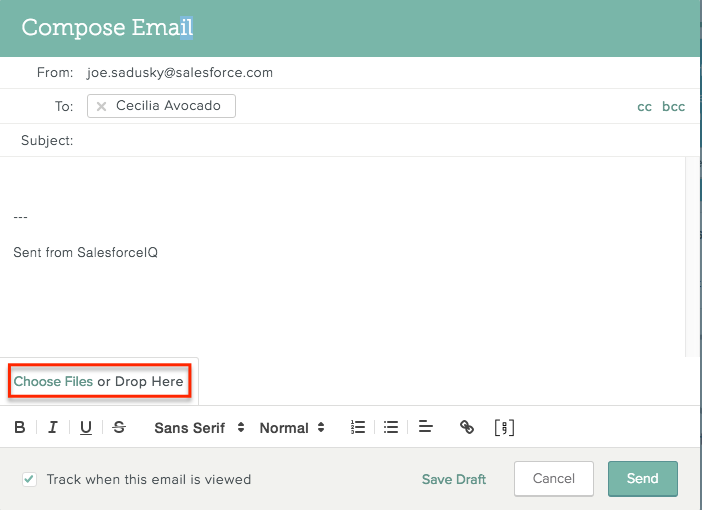 In the SalesforceIQ Communication Center, you can create and work with email templates. 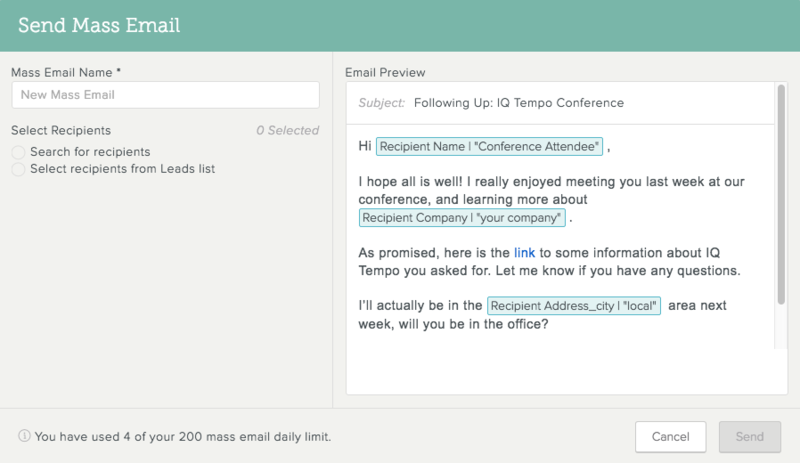 Merge tags in the templates make it easy to send a mass email to multiple recipients. You can create a personal template for your personal use, or publish a template to make it available to everyone in your Organization. Click at the top of any SalesforceIQ screen. In the left navigation panel, click Templates. Enter a template name and subject. The name is used for reporting purposes. The subject appears as the email subject line when it is sent. Enter the message text. Use the toolbar at the bottom of the compose screen to format the message text. Note: You can't add images or attachments to templates. Click the location in the message subject or body where you want to insert the tag. Click in the lower-right corner of the screen. Click whether the tag applies to the message Recipients or Sender. Select what to do if the tag value is blank for a given recipient: Do not send the email, or Insert a default value. For the second option, enter the default value you want to use. Note: For sender tags, only Sender Signature can have a blank tag value. The other sender tags always have data. Click My Templates or Organization Templates to locate the template you want to edit. 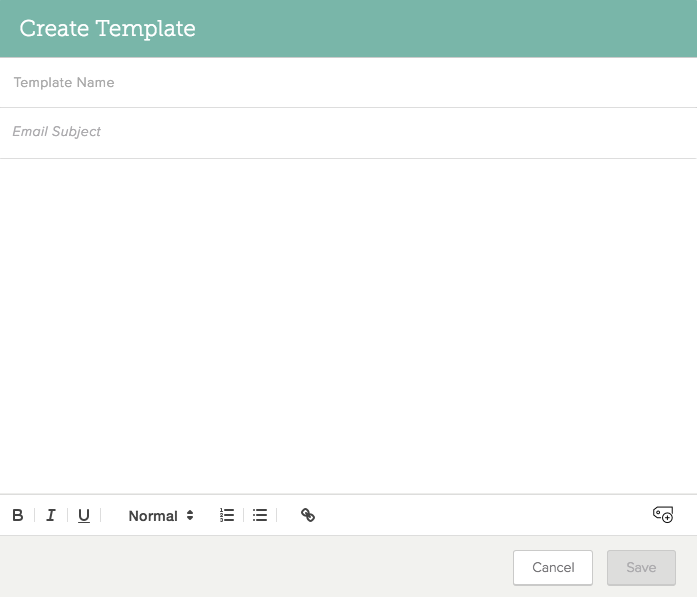 To publish a personal template (available in My Templates only): Click Publish. Click Publish to confirm. If you publish a template, only you and admin users can edit it. Other users who want to modify an Organization template can make a copy and edit it as a personal template. To send a mass email using the template: Click . To copy the template to use as the base for another template: Click . Click Save to save the copy. To edit the template: Click . After making your changes, click Save. 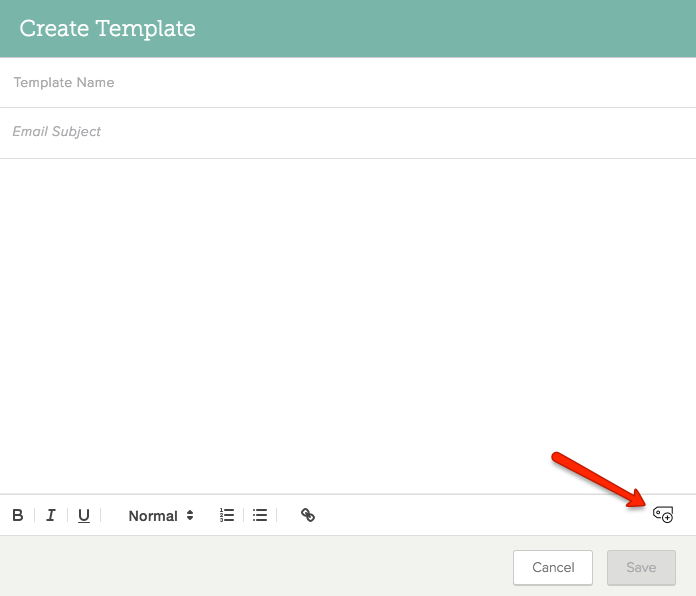 You can edit an Organization template only if you created the template or are an admin user. To delete the template: Click . Click Delete to confirm. You can delete an Organization template only if you created the template or are an admin user. 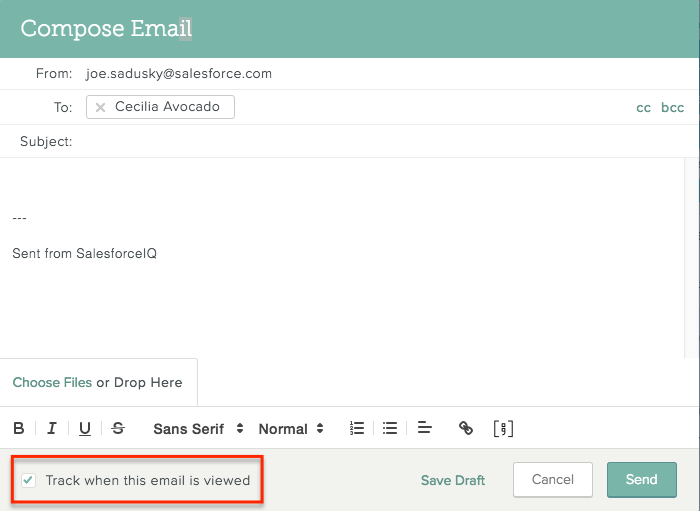 When you create an email template to use for sending mass email in SalesforceIQ, the available merge tags include Recipient Full Name. To create a template with a First Name merge tag, follow the steps listed here. In your Contact-based List, add a First Name Contact property. Export the Contact-based List to a CSV file or Google Sheet. In the exported file, create a new column. We recommended naming it First Name. 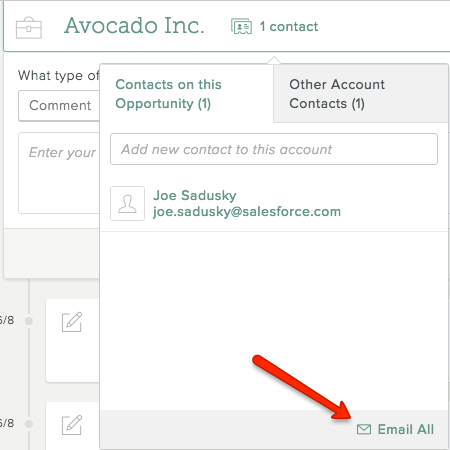 Enter each Contact's first name in the new column. 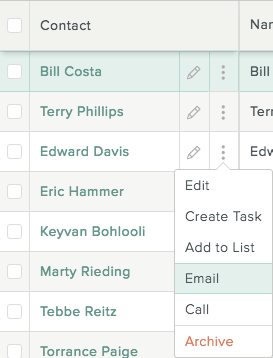 Sort the new column in both your Contact-based List and your exported file from A-Z. 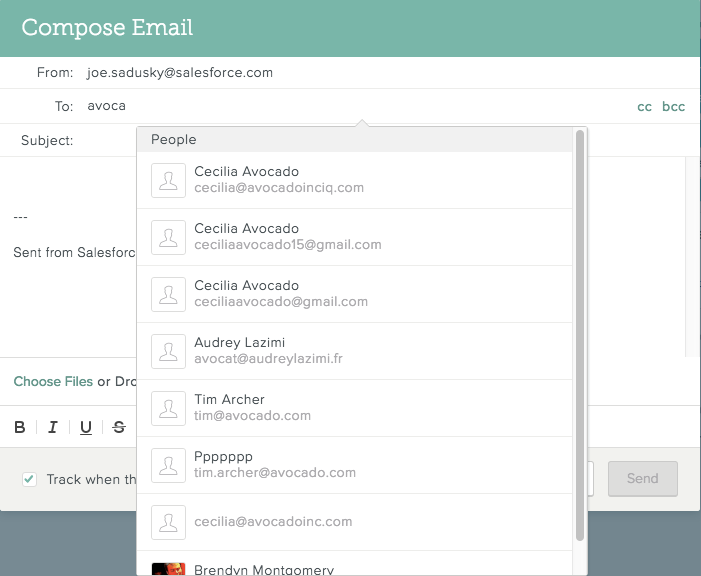 Copy and paste the first names from your exported file into your Contact-based List. 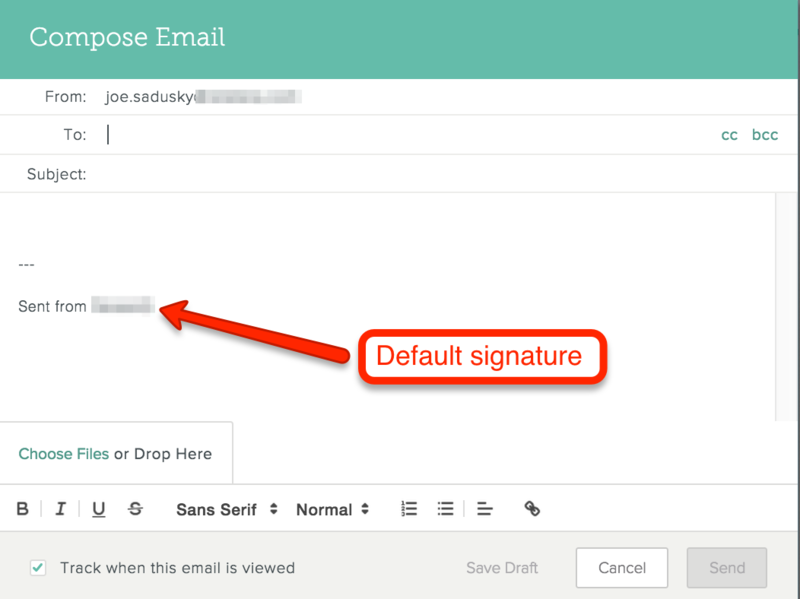 The First Name merge tag now appears as an option when you create an email template. Shortcuts give you an easy way to insert text you commonly use into a message. For example, if your email messages frequently include wording that you will follow up with a prospect by phone, you can use a Shortcut to quickly enter that wording in any message. A few default Shortcuts have been created for you, but you can also create your own. 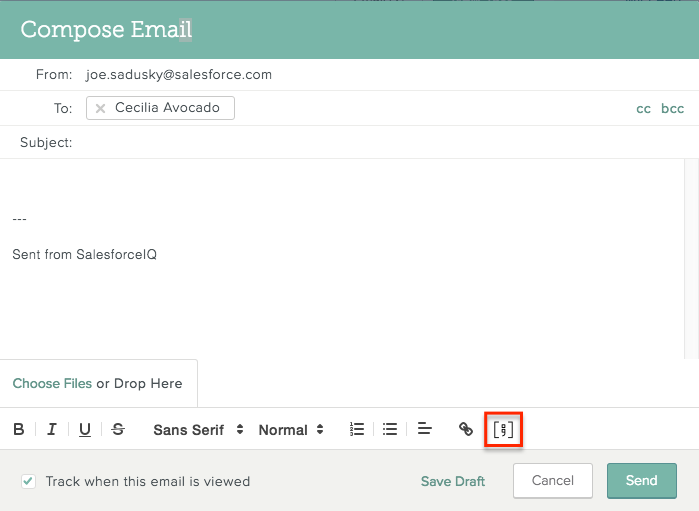 This article explains how to manage Shortcuts in the SalesforceIQ Communication Center. In the left navigation panel, click Shortcuts. Click Add a new shortcut in the upper-right corner. In the Content field, enter the text you want to appear when you enter the Shortcut. As you enter the text, the proposed Shortcut characters appear in the Shortcut field. After you save the Shortcut, you can edit these characters, as described below. Type the Shortcut characters, followed by the space bar. Hover over at the bottom of the compose screen, and select the Shortcut from the list. To edit the Shortcut—Click to the right of the Shortcut, edit the Shortcut content and/or characters, and then click Save. To delete a Shortcut—Click to the right of the Shortcut, and then click Delete to confirm. You can also edit or delete a Shortcut while composing a message by clicking at the bottom of the compose screen and then clicking Manage your shortcuts. The SalesforceIQ Communication Center includes two report sections: My Send Report and My Dashboard. 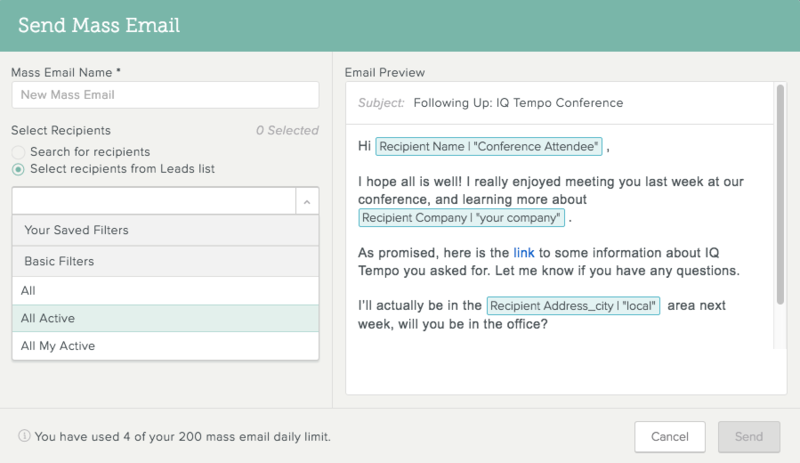 Each lets you track the mass emails you send and the templates included in those emails in different ways. In the left navigation panel, click My Send Report. 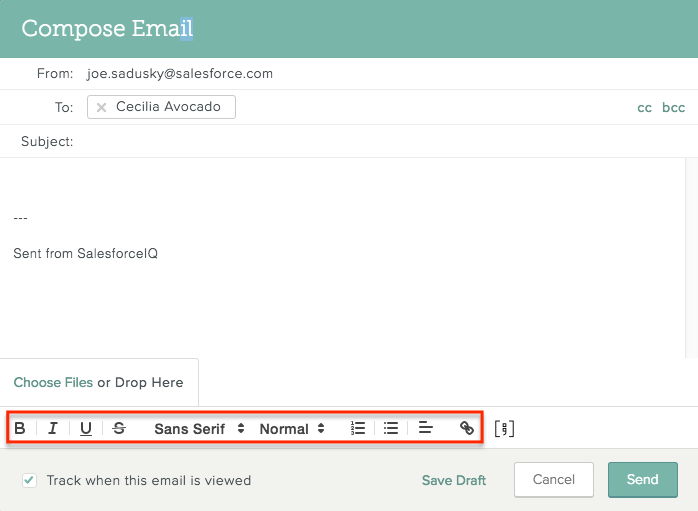 Each sent email is displayed with information about the send as a whole. To view email details at the level of individual recipients, click the email entry. The open rate: The number of unique times the email was open as a percentage of the number of times it was successfully sent. The reply rate: The number of unique times the email was replied to as a percentage of the number of times it was successfully sent. The viewing strength: A visual indiicator of how often your email was opened or forwarded across different browsers and devices.. The dashboard also contains total recipient numbers, average percentages, and visual strength for all mass emails you have sent. In the left navigation panel, click My Dashboard.